A mouse of many guises, here Mickey is a policeman (plain clothes, of course), thrown together with Donald Duck to retrieve the shrink ray and scaled-down gold stolen from Donald's Uncle Scrooge; Donald's the reluctant civilian, forced along on the escapade due to the magnitude of debt he owes Scrooge. The focus isn't whodunnit but adventure, an opportunity for Trondheim and Keramidas to let loose the characters on a breathless journey of skirmishes against an ever-changing backdrop of landscapes, sending up the globe-trotting chase with aplomb even as they reaffirm it. Stock adventure situations are whistled through: a plane crash-landing in a jungle, discovery of numerous lost ancient cities heaving with gold, stumbling upon Atlantis *and* a land of dinosaurs ('I had not noticed, but all der dinosaurs haff feathers! ... If der mobile phone was invented, we could spread der news!' exclaims Dr Einmug), a voyage to space. 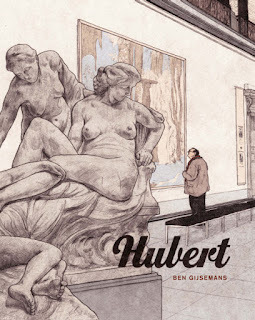 To the Trondheim fan, poking fun at the silliness of genre-conventions whilst subverting them is familiar fare, and it generally works both because its tertiary to the larger concern of creating an entertaining comic and because it's done with affection. Playful effort has gone into the overlaying narrative of the 'lost' strips: replicating the dotted effect of offset printing and spot colouring, torn pages, stains and yellowing, missing pages (strips jump from chapter 24 to 27). Deliberation means the imaginary plot gaps don't lead to an indiscernible mess, instead paralleling the incomprehensible leaps such stories often make. By and large these elements are balanced enough to not feel contrived, yet there remain passages that are simply unengaging. This isn't a book with deep characterisation, emotional investment, or plot; its purpose is fun. There are a few good gags: a thwarted Mickey unsuccessfully attempting to buy modes of transport from various pragmatic kids in a non-chase; a monkey stealing Mickey's suitcase for it to come open and reveal multiple pairs of those famous red pants as its sole contents. But essentially there's only one joke. The construct of deconstruction begins to feel thin. Similarly, patchy commitment to emulating a retro palette appears to have an adverse effect on Brigitte Findakly's colouring. Throughout most of the book, her colouring is wonderful: intuitive, earthy, and interesting. There's a lovely strip in which Mickey and Donald are riding a flying mushroom island (somehwat ridiculously piloting it like the balloon house in Up), and the contrast of the teal-and-white fungi against a mustard sky is gorgeous. In another wide panel, the rich blues and browns of a meteor-shower hurtling to Earth provide it an additional foreboding frisson. But then there are flat, insipid pages which the eye passes over with nothing of attention to anchor the gaze. Since the limitations of 60's colouring aren't adhered to anyway, and Findackly is clearly capable, this in-between wavering seems a poor directive. Keramidas art is well-judged; carrying movement and expression that feeds into the pacing without overwhelming it and there's a nice, level elasticity that comes to the fore now and again. It has pleasurable appeal, and he's able to hit a tonal appropriateness that evokes a stylistic era without it coming off as mimicry. Amongst it all, his textures and shading are a real highlight, adding life and body to everything from rocks, plants, clothes, caves. I've never read any Mickey Mouse comics previously, and bought this book because I was curious about Glénat bringing on names such as Trondheim, Cossey, Regis Loisel and others, and what those pairings would produce. 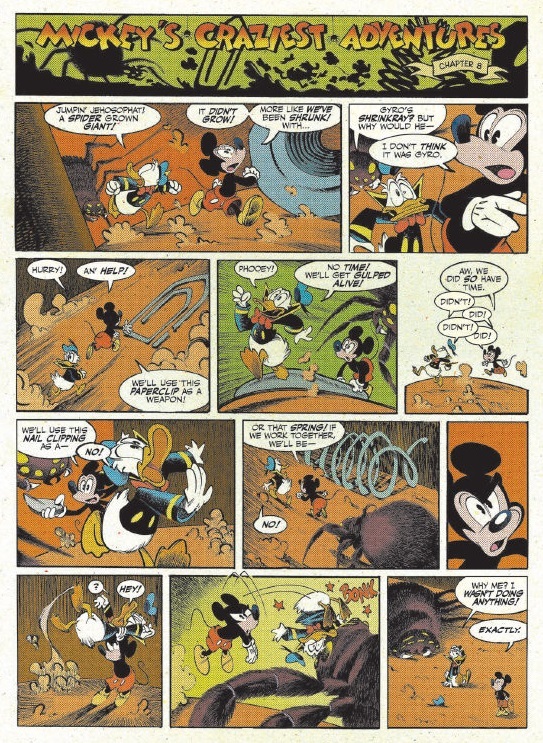 Mickey's Craziest Adventures is a mostly solid affair and while it goes through the motions well enough, there's an unshakeable feeling that it's missing something vital. Something to make you care. Soul, or a heart, perhaps.